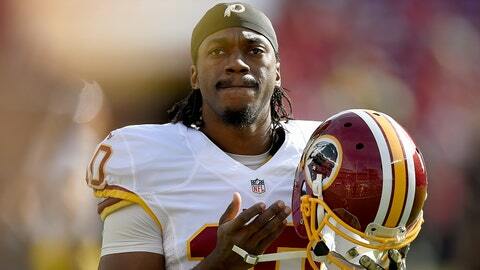 Redskins quarterback Robert Griffin spoke with the media for the first time all season. Washington Redskins quarterback Robert Griffin III dressed for the first regular season game in 2015 in a Week 6 34-20 loss to the New York Jets. Griffin admitted to being surprised by the team's decision to have him suit up in Week 6 after five straight healthy scratches to start the season. Starting quarterback Kirk Cousins struggled with interceptions again, but Griffin refused to take the bait when reporters asked him about the possibility of seeing him regain the starting quarterback job.